Sera Monastery is one of the ‘great three’ Gelukpa university monasteries of Tibet. The original Sera monastery is in Lhasa, Tibet. 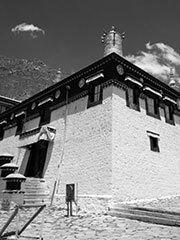 It was founded in 1414, by Jamchen Chojey (Sakya Yeshe), a disciple of Tsong Khapa. Ngagpa Dratsang, built in 1559. After the Chinese annexation of Tibet and the subsequent exodus of Tibetan monks to India, Sera monastery was reformed in Bylakuppe, India, near Mysore. Because none of the monks of the Ngagpa Dratsang (Tantric College) survived the invasion, only the Sera Mey College and Sera Jey College were reformed in India. Sera Monastery is still standing in Tibet, and once again houses some Tibetan Buddhist monks. Geshe Michael Roach—founder of Asian Classics Instutite, Asian Classics Input Project and Diamond Mountain university and retreat center.